New full lengh release, based on experience gained by hosting the Shared Night concert series at the B_Flat in Berlin for 3 years. Once a month international artists (all genres all styles) play this concert series. With the start of my hosting I began to record songs ... and put them all in the archives, until in early 2010 I realised I found what I was looking for. My sweet Litter has gone and done it again ...but This time in an even more stripped-up, straight-down manner than ever before. Sure, the man has long been a master at the most audibly intimate, his vocal tracks especially dry and tight with a quite (often quiet) unarming and sometimes even alarming ultra-sincere presence. But on "No Harm Done" our Lord adds to the Mungo stew some home-grown, fully-organic psychedelic backdrops the likes of which we have seldom so heard since Fall broke Back to Winter, I jest you not! Meanwhile, his Litter-ful lyrics are most similarly Brian-"simple" too, as only no-B.S. / nothing-whatsoever-to-hide songsmiths can, and hearin most certainly do. 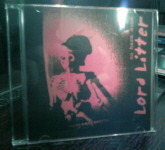 Lord Litter is one of the proud and the few who can stand alone, get all audio jobs well done, and still somehow keep you fully attuned and arm-in-arm up on his magical, mysterious journeys. Truly won-won-Wonderful, and Never any harm done whatsoever. Sneakily seductive. Kind of like circa 1969 acoustic Pink Floy meets the Sons of The Pioneers. Great vocals and guitar work. If I had to categorize your sound I'd suggest something like "retro-progressive". At first I thought "OK, straight forward, simple and basic songs done in the tried and true Litter way" Then close listening revealed to me some strangeness going on. Well, maybe not really strange but touches and flourishes, almost subliminal in nature. In fact, the album gets weirder as it goes on. Not "weird" in a "look at me I'm odd" way but pointillistic drops of paint indicating much more below the surface. There is also some kind of theme of detachment or escape indicated by "Fading", "Floatin in orbit", "Slip Away from fright"...even "Endless". As always, the sounds are crystal clear and delicious, the performance measured and intimate. The guitars played immaculately and the presence of what seems to be ukelele giving a different tone. Not a "happy go lucky" Hawaiian tone but a timbre of something sharp but not dangerous, like a blade of grass. There is also delicate keyboard statements that add color and character to some of the tracks. I have no doubt this album will grow on me and reveal much more as I hear it again...and again. Radio play coming of course. The vocals match the arrangements perfectly and the evolution of your voice continues to delight me with its graying and whiskey tone. Deep and expressive, even more than before. So, thanks for the new music. Honest, refreshing and of course well executed and produced. A real treat. I hear in your lyrics a longing for the days of yore as well as a bit of encouragement for the people caught up in today's hurly burly 21st Century. The whole seems familiar in a sort of Ray Davies way (appropriately enough) as well as in a sort of John Cale way, but it is singularly Lord Litter in a new, yet familiar, guise. Meine Lieblingssongs der CD sind Fading, Floating into Orbit, Time is Mine und Endless. Alles in allem absoluter OWN Style. Kompliment ! L. s Kommentar, als es mal in der Küche lief : " Erinnert mich an *Incredible String Band*" .Sagt Dir vielleicht was ...?! Seit mehr als zwei Jahren schon präsentiert Lord Litter die �Shared Night� Konzert- und Veranstaltungsreihe im B-Flat in Berlin Mitte. Regelmäßig bekomme ich Einladungen dazu per Mail. Dort war ich noch nicht. Aber auch ohne meine Teilnahme scheint die Reihe ganz erfolgreich zu sein. Irgendwann gehe ich mal hin. In schöner Regelmäßigkeit erreichen mich auch neue Aufnahmen aus dem Trash Tone Studio. Die letzte CD �Litter & Leech� kam vor knapp zwei Jahren. Nun kurz vor Weihnachten 2010 fand ich eine neue CD in meinem Postfach. 15 Tracks sind darauf zu hören. Alle bis auf einen selbst komponiert. Alle von Lord Litter ganz allein eingespielt dies Mal. Wird der Lord schrulliger? So kommt es mir wenigstens vor. �Time Is Mine� oder �Slip Away From Fright� sind so schön schräg und verschroben. Was man mit akustischen Gitarren und ein paar Perkussionsideen alles anstellen kann! D.h. ein wenig Elektrizität ist schon auch dabei. Die Stimme des Lords hab� ich rauer in Erinnerung. Er klingt hier ja manchmal fast wie Elvis in einem Alter, das er nicht mehr erlebte. �Call Me Joe� ist klasse! Nicht Freak Folk, nicht Weird Folk, das ist Weird Country, oder? Aber was ist das mit Bert Kaempfert? �A Moment in Silence� erinnert mich eigentlich eher an eine ganz frohgemute Version von �Rosemary�s Baby�. Sehr fein auch die beiden �Pebble� Stückchen. Absonderliche Vignetten mit Pfiff, Klapper und Computer. Ja, der Lord wird sehr schrullig. �Coco� ist der beste Beweis. Nicht, dass er diese Nummer von The Sweet covert, sondern wie er das tut.